Conservatorium Maastricht, very international in its composition and mindset, is a close-knit community. We believe in collectivity, in the will to challenge each other and excel ourselves. To add value, in and with music. We enable and inspire students and lecturers to develop by learning, teaching, creating and performing. We prepare our students for a career in music beyond borders and believe in lifelong learning. Conservatorium Maastricht is the most international conservatory in Europe, with a global mindset, connecting the local to the national and international. Students and lecturers of Conservatorium Maastricht are innovators and offer a valuable contribution to the international world of music and to society, either as performers/creators, teachers, researchers and/or entrepreneurs. Our educational programme is based on links across disciplines as well as with the music industry, other art disciplines, educational and cultural organizations and businesses. We prepare our students for a career in music beyond borders. Conservatorium Maastricht is part of the Faculty of Arts Maastricht of Zuyd University of Applied Sciences, which comprises the Academy of Performing Arts, i-Arts, Communication & Multimedia Design, Maastricht Fine Arts & Design and Architecture. With around forty Bachelor's and thirteen Master's programmes, 15,000 students and 1,700 staff, Zuyd University of Applied Sciences, is one of the biggest universities of applied sciences in the Netherlands. Its wide range of programmes offers countless opportunities for multidisciplinary collaboration. Conservatorium Maastricht offers BA and MA-level programmes in Classical Music, Jazz and Music in Education, which has been recognised as excellent. 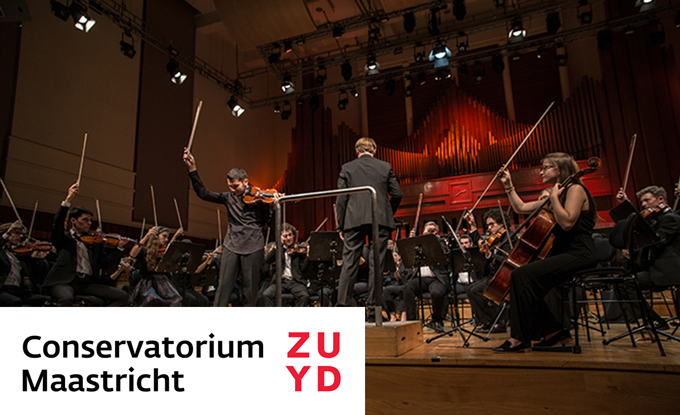 Conservatorium Maastricht is part of the Faculty of Arts of Zuyd University of Applied Sciences. Conservatorium Maastricht has around 500 students and 150 staff. Ensemble performance is central to its profile, with orchestra, opera, choir, (jazz) ensemble and chamber music projects. Related to this are the degree programmes in Conducting, Arranging, Composition and Music Theory. For exceptional talent, the Academy has a soloists’ programme. The programme has struck a balance between quality and critical mass. The students’ international career prospects range from good to excellent. The Head is supported by the project office, the coordinator of chamber music/guest lecturers and collaborates closely with the office of academic affairs and other departments and constituents of the organisation. affinity with/knowledge of artistic research is considered an advantage. preferably also provides education, this can be part of the job. An appointment of 0,8 - 1 fte for a duration of 1 year with the Stichting Zuyd Hogeschool, with the prospect of a permanent appointment. For internal candidates, the current period of employment is respected. Depending on former education and experience, classification takes place in accordance with the CAO HBO within the career perspective of scale 12 (maximum € 5.301,29 gross per month for a full time appointment). For further detailed information, please contact Joachim Junghanss, director of the Conservatorium Maastricht, telephone number + 31 6 4353 3373. You can apply before the 15th of October 2018 by uploading your personal details (including a motivational letter and CV) on the website www.werkenbijzuyd.nl. The interviews will be scheduled between November 5th and 8th 2018. Unfortunately, we cannot process letters of application addressed directly to the contact person or submitted by other means.